The jar rises from a slightly incurved base to a full rounded balloon-like upper body and shoulder of amphora type, incurving to a simple circular mouth rim. A minutely crackled glaze covers the upper two thirds of the jar ending in sweeping lines well above the bevel-edged base. The body is greyish white with a pinkish surface on the base. 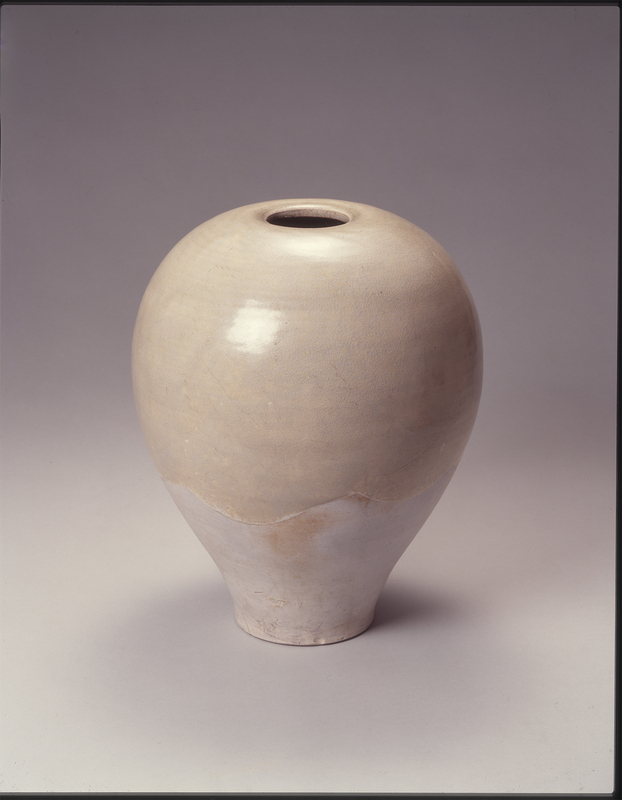 This unusual shape seems to lie transitionally between the standard bulbous jar shape associated with the Tang and the taller, sleeker meiping of the Five-Dynasties/Song period. A white ware jar of similar shape also formed without a neck surrounding the mouth, and with approximately the same type of glaze similarly applied, was excavated from a Tang tomb in Gongyi, Henan province. The piece was published with a lid, suggesting that the present would have also been fitted with one (fig. 1). A similar “neckless” jar in the Asian Art Museum of San Francisco is an earthenware vessel with green and amber lead-silicate glazes dripping on its sides (fig. 2), providing another example of this rare form. Fig. 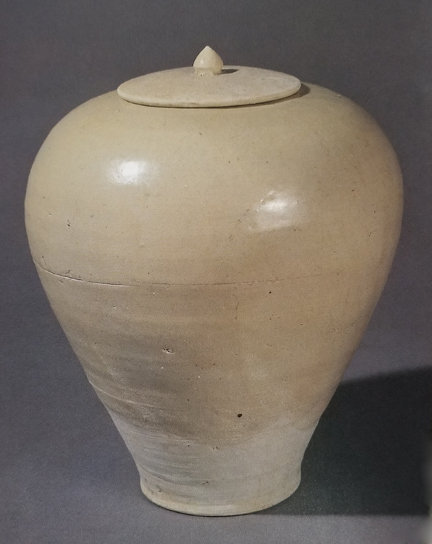 1: White stoneware jar, excavated from a Tang tomb in Henan province, 8th century, after Ceramic Finds from Henan, an exhibition jointly presented by the University Museum and Art Gallery and the Henan Institute of Cultural Relics and Archaeology, Hong Kong, 1997, no. 13, p. 44. Fig. 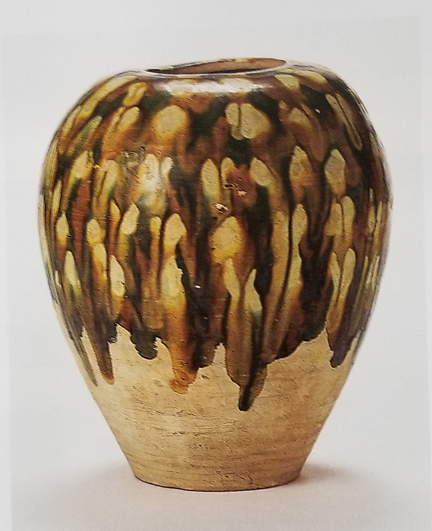 2: Sancai-glazed earthenware jar, Asian Art Museum of San Francisco, after He Li, Chinese Ceramics: A New Comprehensive Survey, the Asian Art Museum of San Francisco, San Francisco, 1996, no. 161.